The Salt River Rafters offense exploded in week four of the Arizona Fall League season as they took a commanding lead in the East division standings with two weeks left to play. They went 4-1 in their five games, scoring 12 or more runs three times and combining to outscore their opponents 54-25. 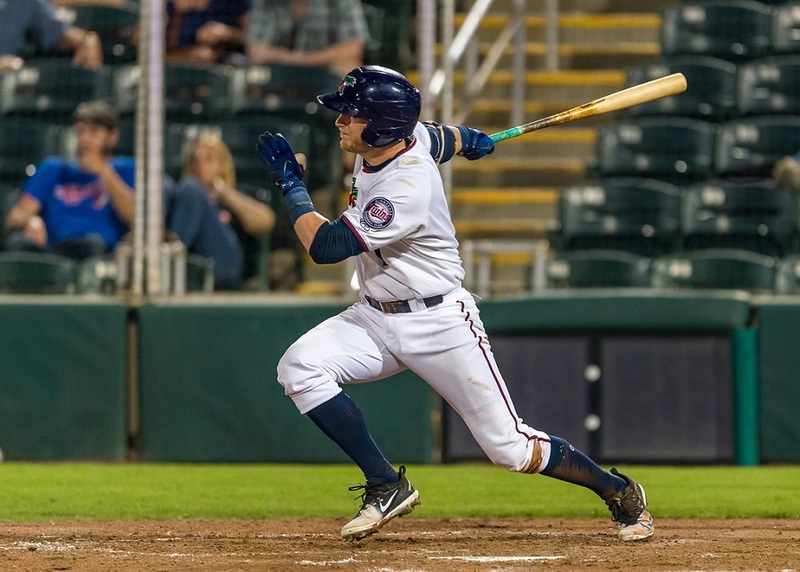 Both Twins hitters still playing had a solid week and will look to continue trending upward as the season comes to a close, a starting pitcher picked up his first win, and a reliever made an appearance in the Fall Stars Game on Saturday. The Minnesota Twins group of pitching prospects combined to pitch eight innings on the week and allowed four earned on seven hits and seven walks, good for a 4.50 ERA and 1.75 WHIP. The hitters combined to go 9-for-22 with six runs scored and six RBIs, slashing .409/.458/.409 overall. To find out how all the prospects fared in week 4 of the AFL season, keep reading! Griffin Jax: 1 start, W, 4.0 IP, 4 H, 4 BB, 3 ER, 3 K; 4.50 ERA, 1.58 WHIP (overall). Jax again made one start on the week, with his turn coming in Thursday’s 14-3 win over Glendale on the road. He finished four innings and was credited with his first AFL win, but it wasn’t a dominant effort by any means as he struggled a little with his command. He walked the first hitter of the game for the Desert Dogs, and that runner and another would come around to score in the first inning. He picked up a K to end any further threat. In the second frame he got another K for the first out, then walked another batter before getting the next two. In the third he allowed another run after the leadoff man singled, stole second base, then came around on another single. Jax finished his day by allowing a walk in the fourth, but no other runner reached base. In total he allowed the three earned runs on four hits and four walks while striking out three. Of his 76 pitches in the outing, 45 went for strikes including six swinging. Travis Blankenhorn: 2 games, 4-for-8, 3 R, 4 RBI, BB, 2 K; .250/.361/.300 (overall). Playing second base in two games on the week, Blankenhorn made an impact in both contests as his team won those games by a combined score of 22-7. In Tuesday’s 14-4 throttling of the Mesa Solar Sox, Blankenhorn batted sixth and made the most of his opportunities to drive runners in. In the second inning he got his team on the board with an RBI single and would score later as the Rafters jumped out to a 3-0 lead. In the third his sacrifice fly made it 4-3 and he added an RBI single in the fifth as Salt River started to pour it on. In addition to starting the Rafter’s scoring on the day, he also ended it with an RBI single in the eighth for the final tally of 14 runs on the game. In total he finished this one 3-for-4 with a run scored and four RBIs. Back in action on Friday for their 8-3 win over the Surprise Saguaros, Blankenhorn batted leadoff and made the most of his opportunities to score runs. He drew a walk to lead off the top of the third inning and would score a few batters later on a home run as Salt River took the early 2-0 lead. He singled in the top of the sixth and would trot home on a sacrifice fly for their eighth and final run of that game. He went 1-for-4 with a walk, two runs scored, and two K’s to finish off his week. Hector Lujan: 1 appearance, 1.0 IP, BB, K; 7.94 ERA, 1.94 WHIP (overall). With the week shortened by one game due to the Fall Stars game on Saturday, Lujan and the rest of the pitching staff only appeared in one league game each on the week. His opportunity came after Jax’s start and another Twins reliever’s appearance in Thursday’s win over Glendale. Out for the seventh inning with a 12-3 lead, Lujan got a couple of fly outs around a walk, then ended his inning with a swinging strikeout for a scoreless inning of work. He threw 19 pitches, with 12 going for strikes (two swinging). Jaylin Davis: 3 games, 5-for-14, 3 R, RBI, 4 K; .261/.292/.261 (overall). Among Twins prospects in week four, Davis saw the most action as he played in three games including right field twice and left field once. In Monday’s 12-3 blowout of the Mesa Solar Sox Davis had his best game of the AFL season, finishing 4-for-5 with three runs scored and an RBI. In the bottom of the first his two-out single scored the second run of the game for the Rafters, before the next batter made it 5-0 with a home run. In the third inning Davis beat out an infield single and then stole second base before scoring on a single that made it a 7-0 lead. He was left stranded after a single in the fifth but would score his third run of the game in the seventh inning after yet another single. On defense in the sixth, Davis ran down a ground ball single in right field and threw a strike back into second base to cut down the runner trying to stretch it into a double for another outfield assist. After a day off on Tuesday, Davis was in left field for the Rafters 12-6 loss on Wednesday to Glendale in extra innings. He was 1-for-4 with a strikeout, and his hit came in the bottom of the 10th inning after the Desert Dogs had scored six in the top half. He was also hit by a pitch in the game, so he reached base multiple times. Davis played in back-to-back games to end his week, going 0-for-5 in Salt River’s win over Glendale on Thursday. He struck out twice but also hit a couple of hard balls that turned into outs. Devin Smeltzer: 1 appearance, 1.0 IP, 2 H, 2 R (1 earned) 0 BB, K; 2.57 ERA, 1.43 WHIP (overall). Smeltzer’s lone appearance with the Rafters came on Wednesday, and he was charged with a blown save before his team ended up losing in extra innings. He came on for the top of the eighth, with the Rafters up 5-4 at the time. He got the first man on a strikeout and a fly out for two quick outs, but consecutive doubles and an error on his defense led to a 6-5 lead for the Desert Dogs. He got a groundball to keep his team within one, and they would tie it in the bottom of the ninth, but extra innings didn’t go so well for his team. Of his 21 pitches, 16 went for strikes in the outing, including two swinging. He did make one other appearance on the week however, as he was the Twins lone representative in the Fall Stars Game on Saturday. He pitched 2/3 of an inning in the East squads 7-6 loss to the West. He came on to start the sixth inning and struck out the first two hitters he faced before issuing a walk and being removed from the game. The pitcher who followed proceeded to give up a single and a triple so Smeltzer ended up being charged with a run. Of his 16 pitches, eight went for strikes including four swinging. If not for the walk, it was a solid showing in the game for him with a lot of eyes watching. Adam Bray: 1 appearance, 2.0 IP, H, 2 BB, K; 1.00 ERA, 1.11 WHIP (overall). After Jax went four innings in Wednesday’s win against the Desert Dogs, Bray came on for the fifth and pitched the next two frames. He allowed a single in the fifth, and two walks in the sixth, but was able to work around them, including ending his game with a strikeout to keep his team ahead 7-3. He threw 38 pitches total with 24 going for strikes (1 swinging). - With the Fall Stars game likely be the biggest attraction of the AFL season, MLB.com went through their list of best tools appearing in the game. The Twins Devin Smeltzer got an honorable mention in the Best Control category. - Also in reference to that game, were MLB.com’s guide to all the player’s appearing from each team (Smeltzer’s AFL season so far briefly recapped) and their gamer on how it was won in walk-off fashion. There were multiple prospects to hit 100 MPH on pitches (including one at 104 from Nate Pearson of the Blue Jays), and Vlad Jr. also hits the ball really hard (if you didn’t know that, already). Great write up Steve. Thx much as always for the dedicated work . Is it OK to feel a little disappointed in the overall results? WHIP's well above 1.2, low batting numbers. I understand SSS, injuries, but no one is exactly blowing me away.